Rosella is thought to have originated in Sri Lanka, introduced to Australia by Indonesian fisherman. Having grown here for thousands of years, it has developed characteristics that make it uniquely Australian — despite all being the same species, our variety differs to the Hibiscus sabdariffa of New Guinea, Indonesia and China. In the wild, you can find this edible hibiscus growing in the forest, rainforest and sand dune regions of our tropical north. 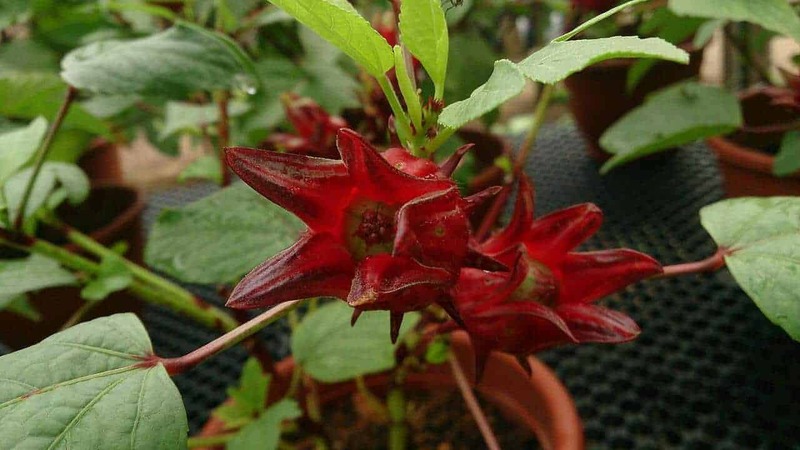 The Rosella bush produces red edible calyxes that are high in vitamin C. They have a pleasant tart-sweet flavour that goes well in salads, jellies, red sauces, jams, cordials, syrups, fruit teas and wine. They are often found in shops, preserved whole in syrup or liquid, as a decorative and flavouring additive for cocktails, white wine or champagne. The seeds may be roasted and ground into flour. The young leaves may be steamed or stir-fried – these are also known as red sorrel. After flowering, the large fleshy calyx is ready for harvesting. The first harvest is usually underwhelming, but this plant will produce a more prolific harvest after its second flowering in Autumn. Simply snip the plumpest calyxes straight off the bush. Rosella is a hardy plant, adapted to a range of Australian climates. It can survive dry spells, but for best results, plant in fertile, well-drained soil and water regularly. A tropical plant, Rosella is frost sensitive and grows as an annual in regions with cold winters. In this case, leave a few calyxes unharvested before Winter, then save the seeds for a future planting. This plant can reach up to heights of 2m in a very short period, though it also grows comfortably in a vegetable bed or a large pot. Why is my Rosella dying? Rosella is a fast-growing annual that loves the heat. It’s normal for this species to die during winter. How do I pick Rosella flowers? A couple days after blooming, the flower petals will shrivel up and fall off, leaving the ripe, red calyx. It should appear closed and have a solid feel. If ready for harvest, it should easily snap off the plant. How do I prepare my Rosella calyxes for cooking? First, sever off the stem, then cut a slit lengthwise along the calyx and pop out the seed pod using your fingers. This will leave you with the sweet calyx flesh, intact and ready for cooking. Do I need to prune my Rosella? Yes. After the first harvest in Summer, prune your Rosella bush back by one-third to encourage new growth for your next harvest.